RIO VISTA, Texas -- Years before a couple accused of torturing, shackling and starving their 13 children moved to California, they lived in a Texas home where a prosecutor said they also tortured their then-much younger family. When they moved, David Allen Turpin, 56, and Louise Anna Turpin, 49, left the Texas home in squalid condition, and a photo shows an apparent rope tied to a bed frame inside, a former neighbor and the home's buyer told the Los Angeles Times. The couple have been charged with committing years of torture and abuse against the 13 malnourished siblings, ages 2-29, who they allegedly kept captive in their Riverside County, California home. The alleged crimes for which they're charged date back to 2010, when the couple moved to Riverside County from outside Fort Worth, Texas. But the abuse began in Texas Riverside County District Attorney Mike Hestrin said last week. The children were allegedly tied to beds with ropes, or hog-tied. When one child was able to wriggle free, the couple began restraining them with chains and padlocks, for up to months at a time, Hestrin said. After the family left the Rio Vista, Texas home, their cars were re-possessed and the home was foreclosed, the Los Angeles Times reports. Billy Baldwin, who bought the house the next year, told the paper it was trashed and the bathroom floor had rotted through. Inside, he found several Polaroid photos taken when the Turpins left, with one that shows a bed with a metal rail and a rope tied to it. 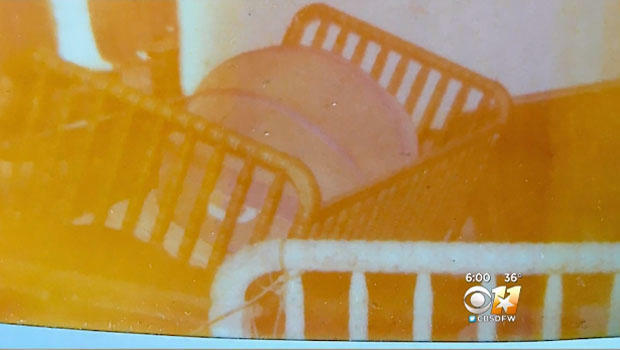 The photo was obtained last week by CBS DFW through the home's buyers. Neighbors in Texas told the station they recalled one of the girls ran from the home and was picked up on the road, asking for help getting an apartment and a driver's license. The girl was eventually returned to the family. The Hill County Sheriff's Office told the station they had no record of a call to the home. Patrick Crimmins with the Texas Department of Family and Protective Services said Saturday that his agency had no investigations concerning the Turpins. And the director of the Riverside County Department of Social Services in California told CBS News' David Begnaud her agency received "not one" call about the family. A former neighbor of the Turpins in Texas, Ricky Vinyard, said the family moved to the town in 2000 and that he rarely saw the couple or their children. He said the family stacked trash in a dumpster in their yard and a nearby double-wide trailer, kept lights on at all hours, blinds drawn, and one Christmas they bought eight new children's bicycles that sat outside, unused. Vinyard told the paper he recalled walking through the family's trailer after they left, saying it was "waist-deep in filth" with dead dogs and cats and a "rancid" smell. He said he found two Chihuahuas that had survived by eating waste from soiled diapers. He said the family's truck was full of dirty diapers and Vienna sausage cans, telling the paper, "it seemed like that's all they ate." Walking through the home, he said he found a feces-littered living room and what appeared to be a makeshift classroom with eight small desks and a chalkboard. The family had claimed to home-school their children. He said everything in the home had locks on it – including a toy chest, a refrigerator and a closet. "There were no beds, just mattresses," he told the paper. "There wasn't a place in that house that wasn't filthy." Vinyard told the paper he wished he had reported the family to officials in Texas. At one point while in Texas, the parents lived in a separate house from most of the children and dropped off food to the others from time to time, Hestrin, the prosecutor in California, said last week. Hestrin revealed shocking details in the case as they announced the charges Thursday. They said the 13 siblings, who range in age from 2 to 29, were were so severely malnourished that they appeared to be much younger than their ages. A 29-year-old woman weighs 82 pounds, and a 12-year-old weighs as much as an average 7-year-old, he said. He said the siblings were not allowed to use the bathroom, they were allowed to take only one shower a year and were only allowed to wash their hands above the wrist. They were fed very little and were on a strict schedule. The couple would apparently buy food for themselves and then let the siblings look at it but not eat it, Hestrin said. Authorities in California discovered the siblings' plight a week ago when a 17-year-old girl escaped through a window and called 911 from a deactivated cell phone. Authorities said she spent more than two years working on the escape plan with her siblings. The couple has been charged in California with multiple counts of torture, child abuse, dependent adult abuse and false imprisonment. David Turpin was also charged with performing a lewd act on a child under age 14. If convicted as charged, they face up to 94 years to life in prison. They have pleaded not guilty.